First Year Design Engineering students are set to compete in the Institution of Mechanical Engineers’ (IMechE) Design Challenge national final, after winning the Greater London regional heat. Competing against teams from other London universities, students had to use their engineering skills creatively to develop mechanical devices capable of throwing a lifeline up to six metres – on a budget of just £20. “We’re very proud of the success of our students,” said Dr Alex Zivanovic, Course Leader of the BEng and MEng Design Engineering degrees at Middlesex. 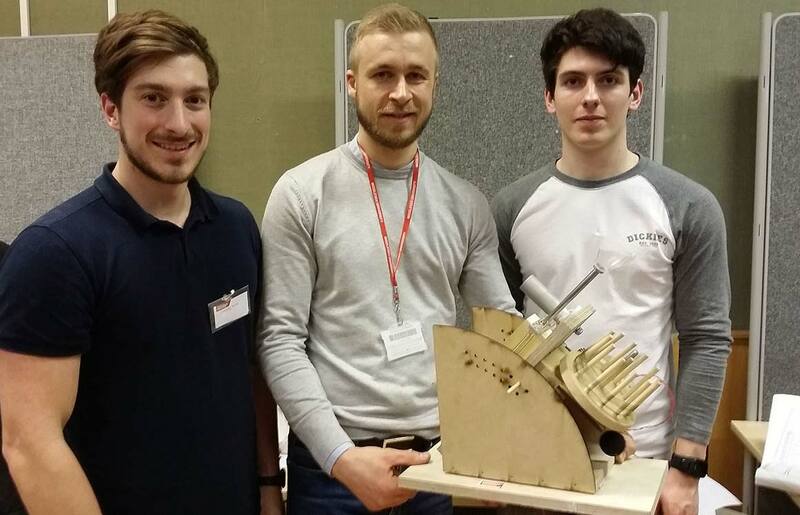 After a nail-biting final against students from UCL, first year students Mantas Zadeika, Tommy Arno and Thomas Maund won the £500 first prize and brought home a trophy to display in the School of Science and Technology. They will now take part in the national final in October at the IMechE HQ. Earlier in the week two teams of second year students were also successful in the Year Two heat which required them to build a device capable of climbing up and down a copper pipe several times and stop exactly in the middle. Rahul Vekaria and Piotr Nowicki won first prize and £100 for their poster and picked up a £500 prize for coming first overall. “I wanted to enter because I’m here to make the most of my time at University and my experience as a student,” said Rahul, who is originally from Nairobi, Kenya. “It’s amazing seeing other engineers work. The competition is effectively a scaled version of a real job somebody has put out to tender and you see how others have responded to the same challenge. Fellow second years Michal Miszczyk and Rodney West won first prize and £200 for the best peer-reviewed device, and came second overall with a £300 prize.